Ya know what? I work for a wonderful company. Last night saw the culmination of just 2 days worth of fund raising bring in just shy of $7,000 for the St. Baldrick’s foundation. 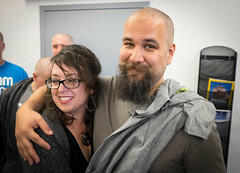 Kudos and thanks to Natasha for arranging the whole deal and to St. Baldrick’s for allowing Twilio to put on our very own event. I’m overwhelmed by the support I’ve received from my co-workers and from Twilio as a company. In a time where I could have very well felt weird and out of place I’ve actually been able to feel kind of normal and at very much at ease about my next 12 weeks away from my fellow Twilions. I’ve participated in St. Baldricks 3 times before but never when it meant so much to my mental health. There’s a lot of good causes to give to right now, and Twilions love to donate (really, they do, if you need money, find a way to get your cause in front of a Twilion, its like guaranteed money!) and I’m just so happy that we got some good donations as well as some great participation. I’m humbled that so many would come together for something put together in my name. And remember, kids, love your nuts and check ‘em for lumps.